Want to Look More Professional? 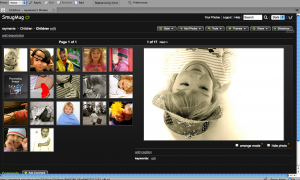 Have you outgrown Flickr? Feel you’re a bit too good for Photobucket? Recently I’ve been trying out a couple of alternatives for showing off your shots. You can choose from a variety of themes depending on your asthetic preferences and make photos available to be viewed in sizes ranging from small to X3 large (plus the original size). One feature I really like, if you go for the slightly more expensive “power” account, is the option to disable visitors from right-clicking and saving your photos. A nice, simple deterrent to help keep your photos a bit safer online. You can also password protect galleries or hide urls so only people you sent the link to will be able to access them. So far I’ve found the website easy to use and if you’re technically-challenged there’s a video to help you get started. 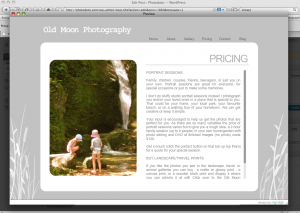 There are free uploaders to work with Aperture, iPhoto, Picasa, Lightroom, and your browser. At $39.95/year it is a bit more expensive than Flickr ($24.95/year) but with around 300, 000 users compared to Flickr’s more than 32 million there’s more personal service on offer at SmugMug, in fact they have a team of SmugMug Super Heroes waiting to help users out. And you’ll stand out from the crowd a bit more too! To sign up, or try out a 14-day free trial, click here. I have found that the software crashes quite easily, which is irritating, although so far it has always managed to start up again without losing any of my work. The level of customisation available is great and the software is fun to play with, hours of endless fiddling to get your site “just right”! For some more example sites have a look here, or to download the software click here.